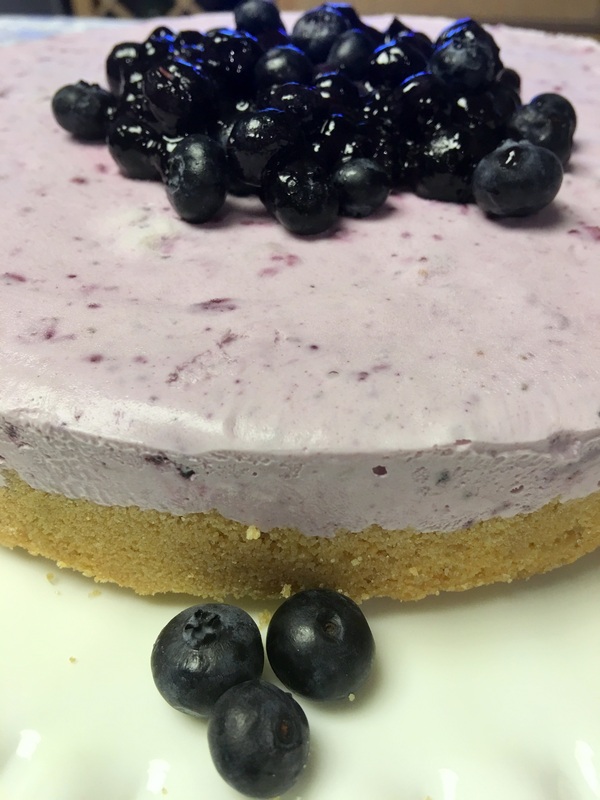 Children love Frozen Blueberry Yogurt Dessert (I made it on Guys Grocery Games on Food Network)! 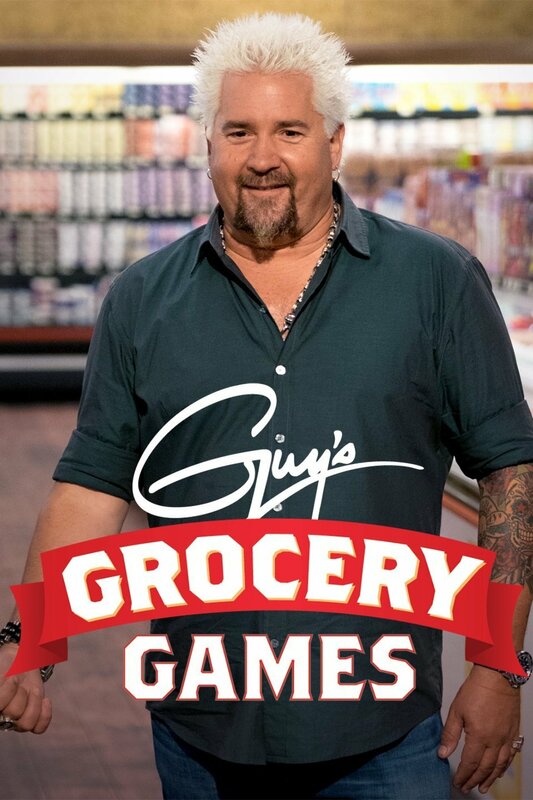 Yes I was honored to be on Guys Grocery Games and it was the Grandparents show. Four grandparents competed to win $20,000. I’ll let you watch the show to find out what happened. Our first task was to produce my grandchildren’s favorite dish using less than 10 ingredients. My grandchildren are constantly wanting something sweet and love candy, of course. Knowing that candy is not healthy at all for them, I always try to make their desserts with a healthy twist. So my first thought was to make a pie that I had loved in the past and put a little candy in it. 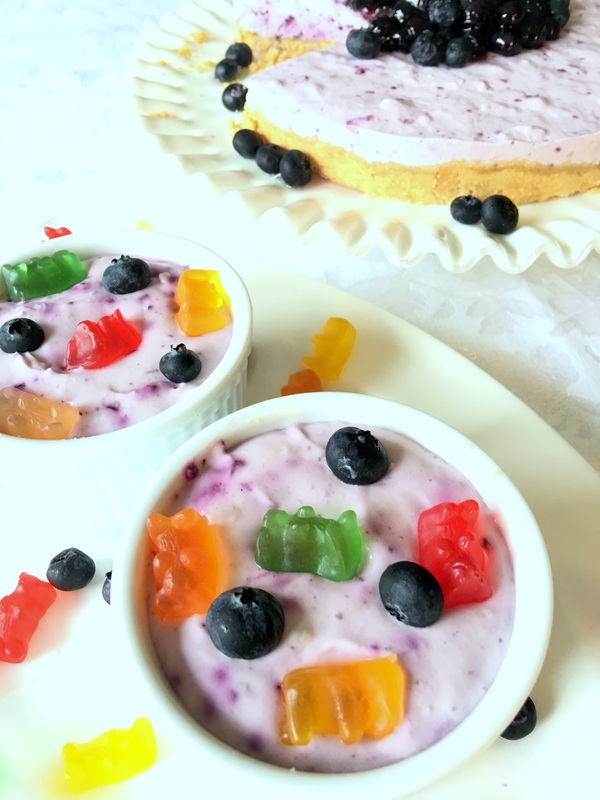 This Frozen Blueberry Yogurt Dessert is lovely, light and delicious and is somewhat healthy with the yogurt and blueberries. I am making two versions of this dish. 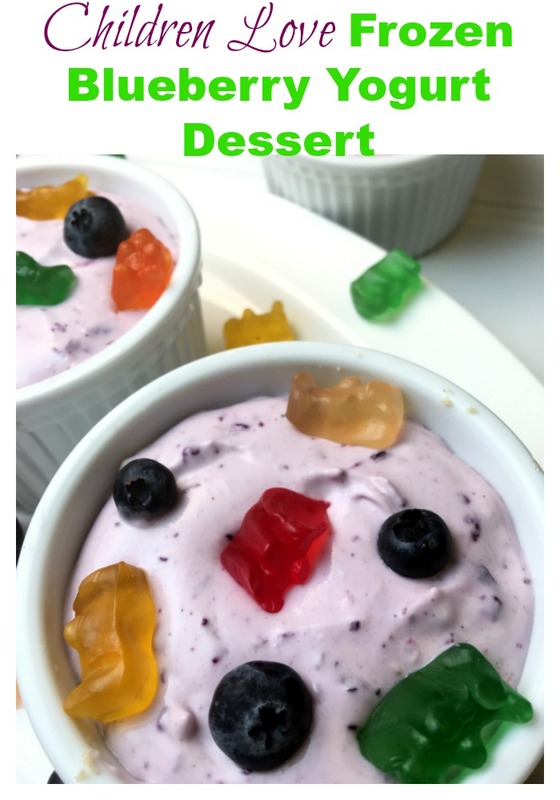 The first is Frozen Blueberry Yogurt Dessert similar to the one I made on Guys Grocery Games but improved because I don’t have the time restrictions and I am able to use a few more ingredients. I used gummy bears in this version but on the show I used jelly beans. 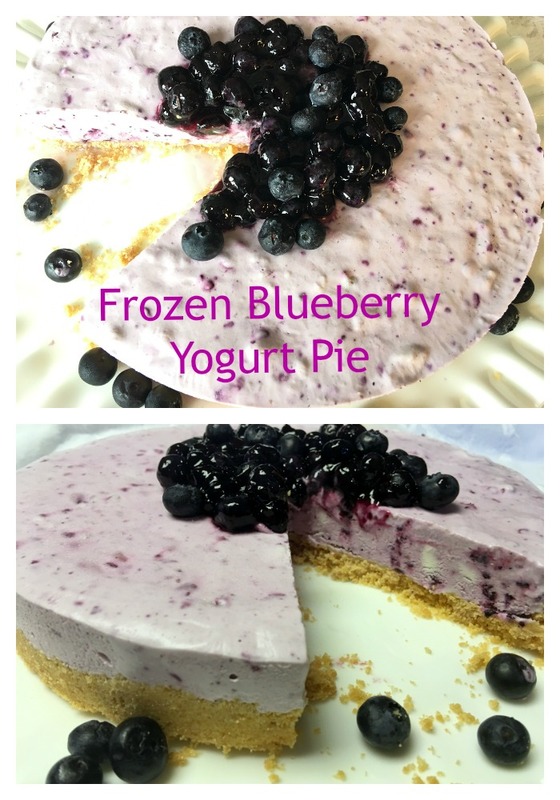 The second one, a Frozen Blueberry Yogurt Pie, is the incredible original recipe that I was remembering while on the show that I was trying to recreate. 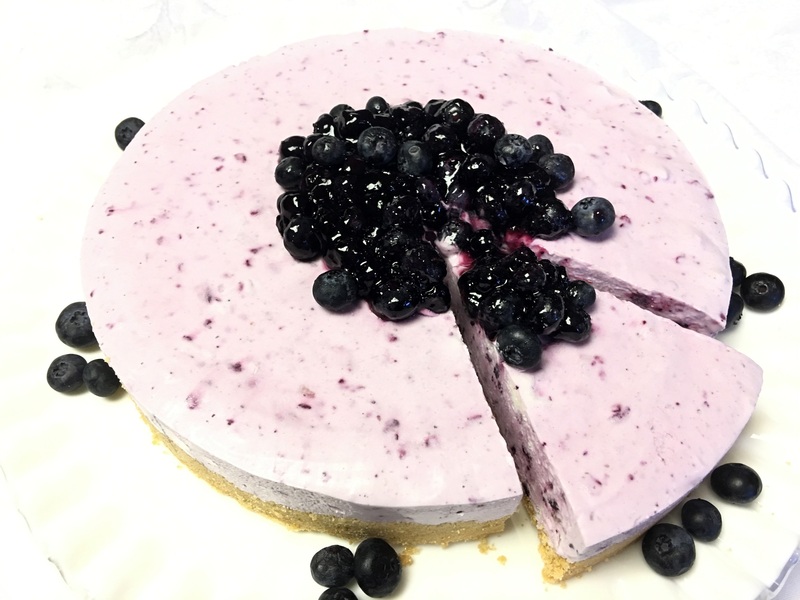 The crust is made with shortbread cookies and the filling is blueberry yogurt, whipped cream, cream cheese and fresh blueberries. The addition of the gummy bears was to make it more fun for my grandchildren to eat. Thirty years ago was the first time I had this pie. I remember getting up in the middle of the night to eat it because it was so delicious! Can you believe how scrumptious it looks? And it is just as scrumptious to eat as it is to look at! For the crust: Place shortbread cookies in food process and process until crumbs form, add sugar and butter and process for a minute. Set aside. For the filling: In mixer whip together cream cheese, sugar and 2 cups blueberries until blueberries are chopped. Set aside. Clean mixer bowl and add heavy cream and whip on high until peaks form. Stir in powdered sugar and vanilla. Add cream cheese mixture to whipped cram mixture and fold together. For the topping: Place 2 cups blueberries in bowl and add blueberry jam. Add filling to almost the top of containers..
Top with gummy bears and blueberries for the children or blueberry filling for the adults. That is so cool you got to be on the show! I'll have to watch it. My kids (9 and 11) would love this dessert too. Great job! It was loads of fun being on the show. Thank you Jill. Oh wow, my niece and nephew would be all over this recipe. Will have to make it for them! My grandchildren loved it! Thanks Lisa. I love yoghurt dessert, this is much healthier than cheesecake or ice cream cake! Yes it is and so easy to make! Thanks Diana! I would have to agree all the kids love frozen yogurt! This looks amazing! Kids do love it! Thanks Meg! How fun was that? Great yogurt recipe, too! Blueberries are so healthy! It was a fun being on the show! Thanks Christina!